The lavishly decorated letter R, composed of a Corinthian column and two dolphins rubbing noses, forms the frame for this powerful narration of the mystery of Easter. Having risen from his tomb inside a rocky formation (left), Christ hovers halfway between heaven and earth in golden glory, illuminating the nocturnal landscape. Astonished and not yet fully awake, two soldiers witness the miracle in the middle of the night, while a third soldier is fast asleep. The dark, strong palette enhances the solemn atmosphere of this mystical event. 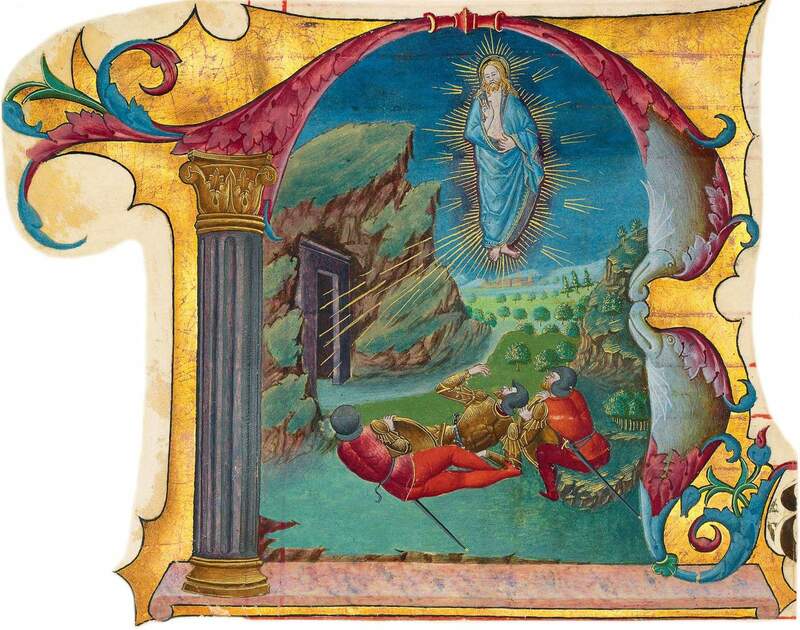 The miniature is attributed to Giovan Pietro Birago, who was a prolific artist (d. Milan 1513). His activities are known since 1471 when he illuminated choirbooks for the cathedral of Santa Maria Maggiore in Brescia. In the 1480s, he worked for leading Venetian families, and around 1490, he entered the service of the Sforza in Milan. Here, he made his finest work in the Sforza Hours for Bona of Savoy (London, BL, ms. Add. 34294). The style of our miniature dates from his earlier years, probably about 1470, the same time as his work in the Brescia corali.